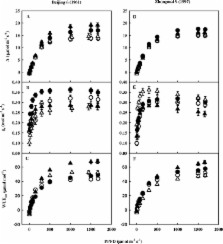 Keywords: elevated CO2, in vivo biochemical parameters, ozone, photosynthesis, relative growth rate, stomatal conductance, Tritium aestivum L., winter wheat. The beneficial effects of elevated CO2 on plants are expected to be compromised by the negative effects posed by other global changes. However, little is known about ozone (O3)-induced modulation of elevated CO2 response in plants with differential sensitivity to O3. An old (Triticum aestivum cv. Beijing 6, O3 tolerant) and a modern (T. aestivum cv. Zhongmai 9, O3 sensitive) winter wheat cultivar were exposed to elevated CO2 (714 ppm) and/or O3 (72 ppb, for 7h d–1) in open-topped chambers for 21 d. Plant responses to treatments were assessed by visible leaf symptoms, simultaneous measurements of gas exchange and chlorophyll a fluorescence, in vivo biochemical properties, and growth. It was found that elevated CO2 resulted in higher growth stimulation in the modern cultivar attributed to a higher energy capture and electron transport rate compared with the old cultivar. Exposure to O3 caused a greater growth reduction in the modern cultivar due to higher O3 uptake and a greater loss of photosystem II efficiency (mature leaf) and mesophyll cell activity (young leaf) than in the old cultivar. Elevated CO2 completely protected both cultivars against the deleterious effects of O3 under elevated CO2 and O3. The modern cultivar showed a greater relative loss of elevated CO2-induced growth stimulation due to higher O3 uptake and greater O3-induced photoinhibition than the old cultivar at elevated CO2 and O3. Our findings suggest that the elevated CO2-induced growth stimulation in the modern cultivar attributed to higher energy capture and electron transport rate can be compromised by its higher O3 uptake and greater O3-induced photoinhibition under elevated CO2 and O3 exposure. The Sequence of Change within the Photosynthetic Apparatus of Wheat following Short-Term Exposure to Ozone. The basis of inhibition of photosynthesis by single acute O(3) exposures was investigated in vivo using analyses based on leaf gas exchange measurements. The fully expanded second leaves of wheat plants (Triticum aestivum L. cv Avalon) were fumigated with either 200 or 400 nanomoles per mole O(3) for between 4 and 16 hours. This reduced significantly the light-saturated rate of CO(2) uptake and was accompanied by a parallel decrease in stomatal conductance. However, the stomatal limitation, estimated from the relationship between CO(2) uptake and the internal CO(2) concentration, only increased significantly during the first 8 hours of exposure to 400 nanomoles per mole O(3); no significant increase occurred for any of the other treatments. Analysis of the response of CO(2) uptake to the internal CO(2) concentration implied that the predominant factor responsible for the reduction in light-saturated CO(2) uptake was a decrease in the efficiency of carboxylation. This was 58 and 21% of the control value after 16 hours at 200 and 400 nanomoles per mole O(3), respectively. At saturating concentrations of CO(2), photosynthesis was inhibited by no more than 22% after 16 hours, indicating that the capacity for regeneration of ribulose bisphosphate was less susceptible to O(3). Ozone fumigations also had a less pronounced effect on light-limited photosynthesis. The maximum quantum yield of CO(2) uptake and the quantum yield of oxygen evolution showed no significant decline after 16 hours with 200 nanomoles per mole O(3), requiring 8 hours at 400 nanomoles per mole O(3) before a significant reduction occurred. The photochemical efficiency of photosystem II estimated from the ratio of variable to maximum chlorophyll fluorescence and the atrazine-binding capacity of isolated thylakoids demonstrated that photochemical reactions were not responsible for the initial inhibition of CO(2) uptake. The results suggest that the apparent carboxylation efficiency appears to be the initial cause of decline in photosynthesis in vivo following acute O(3) fumigation. Targets for crop biotechnology in a future high-CO2 and high-O3 world. Copyright statement: © 2013 The Authors. This is an Open Access article distributed under the terms of the Creative Commons Attribution License ( http://creativecommons.org/licenses/by-nc/3.0/), which permits non-commercial re-use, distribution, and reproduction in any medium, provided the original work is properly cited. For commercial re-use, please contact journals.permissions@oup.com. Keywords: elevated co2, in vivo biochemical parameters, ozone, photosynthesis, relative growth rate, stomatal conductance, winter wheat., tritium aestivum l.
Low growth temperature effects a differential inhibition of photosynthesis in spring and winter wheat. Altered physiological function, not structure, drives increased radiation-use efficiency of soybean grown at elevated CO2. A deficiency in the flavoprotein of Arabidopsis mitochondrial complex II results in elevated photosynthesis and better growth in nitrogen-limiting conditions.